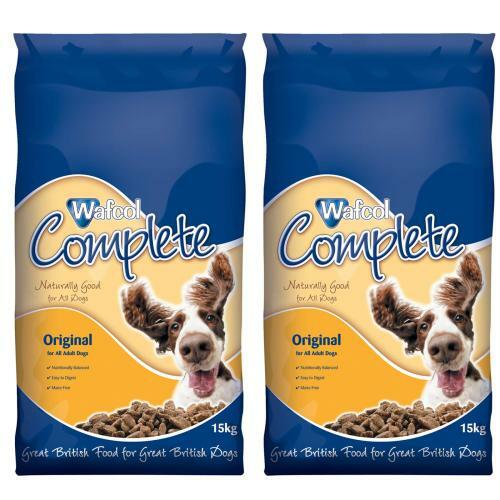 Wafcol offers one of the most comprehensive ranges of complete dry dog food on the market. A range of top quality, British made foods that are nutritionally complete in every way, with over twenty scientifically formulated recipes, Wafcol are confident that they can provide a food for any dog to suit its own particular age, lifestyle or special dietary requirement. Wafcol Maintenance is an outstanding food, which has been carefully formulated to meet all the nutritional requirements of the normally active adult dog. The meticulously balanced levels of protein and energy will help to maintain the correct body weight, whilst the blends of oils, minerals and vitamins ensure that your dog stays in peak physical condition. From strong, well-formed bones to a thick, glossy coat, from toned and well-developed muscles to strong teeth and healthy gums, the benefits of feeding Wafcol Maintenance will show in your dog's appearance. Wafcol Maintenance is available in three appetising flavours - Original, Beef and Chicken - which means that you can regularly offer a new, appetising taste without changing the diet and risking subsequent looseness. In addition, the maize free recipe formulation is particularly useful for dogs that suffer from skin problems or overheating because of an allergic reaction to maize.